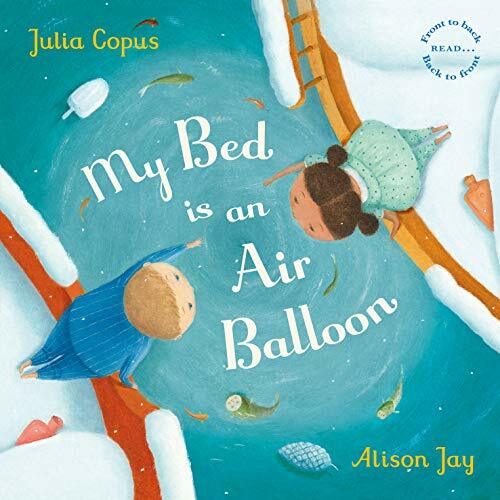 A whimsical picturebook imagining dream sequences in which a child’s bed becomes an air balloon and a sailing boat sailing through the sky over magical lands and seascapes below. The book is cleverly constructed to be read forwards or backwards with a different protagonist leading the action each time, a white boy and a black girl meeting in the middle of the book. The text is a pleasing mirror poem, repeating the rhyming and rhythmic text making it a soothing bedtime read. The descriptive language is appealing, I love the idea of ‘cool night-rustling air’ ‘slipping through finger gaps’. It is full of nonsense words ‘fluttertufts’ and ‘whifflepigs’ to describe the wondrous creatures living in the worlds below. Young readers would find it fun to spot these creatures in the delightful illustrations which evoke the imaginary world beautifully.